We all do it of course. Cover art is important as the quality of printing and binding. But, I recently become painfully aware of other covers which I read or — in this case — choose not to read. A good friend of mine has been lobbying for years to read Ender’s Game, by Orson Scott Card and while I didn’t specifically refuse, I did drag my feet. A couple of weeks ago, I was in the bookstore looking for a mass-market book to take on the plane. Again, Ender’s Game came up but this time I was unable to find another book to buy instead. So, reluctantly I bought it. The “cover” for me here and why I was avoiding the book was general lack of comfort with Card’s politics. Despite it’s status as a Hugo winner and the recommendation of a friend with good taste, I guess I still feared some sort of conservative brainwashing. Needless to say — I was wrong on numerous levels. It was a book that captivated my attention and held it non-stop. I had to curtail my reading for a day so I would have anything left to actually read on the plane. It was a very compelling narrative with great characterization. I was clearly wrong to let this particular “cover” keep me from enjoying a true SF classic. It was not the sympathetic portrayal of the military that I expected. Quite the opposite. I truly enjoyed the contrast between Ender’s significance and fame and Peter’s significance and anonymity as well as how they both desired to and managed to switch positions. I would have liked to see of Peter’s rise to fame/power as a further contrast to Ender. My primary concern with the novel is that toward the end the narrative pace (and time elapsed) picked up considerably and it seemed to start looking forward to a sequel rather than relishing in the story being told. Even though the plot line was clearly done, the novel didn’t feel over but nor am I particularly inclined to seek out the next book — despite getting past this cover. This entry was posted on June 6, 2008 at 7:59 pm and is filed under Uncategorized. You can follow any responses to this entry through the RSS 2.0 feed. You can leave a response, or trackback from your own site. It is pretty good, no? 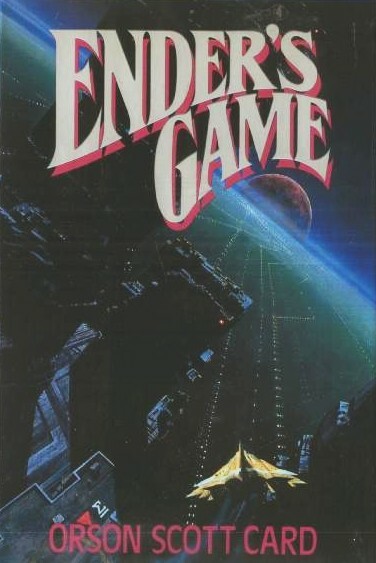 I didn’t enjoy the later books–could not even get into them, even–but I found Ender’s Game to be a smart text. I had heard that later books were not as good. I might try them out one day but there is quite a bit in the line already.